‘McQueen Shoreditch Volume One’ is the brand new compilation from Seamless Recordings which has just been released this week. 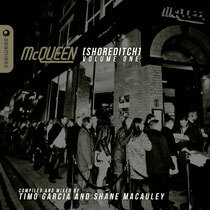 From soulful deep house to underground tech house selections, this two-part album mixed and compiled by Timo Garcia and McQueen’s Shane Macauley captures the vibes of the award-winning McQueen. Based in the east end of London in Shoreditch, McQueen is host to some populpar brands including Hed Kandi, Pukka Up and Seamless Sessions. Making his mark on Disc 1 is McQueen resident and Events Director, Shane Macauley, with a selection of tracks currently popular on the dancefloor. To name a few, Brett Gould’s mix of Grum’s ‘In Love’ (recently featured on Pete Tong’s Essential Selection), the Ridney re-work of ‘Missing You’ and an exclusive Alias Rhythm mix of J.Cub feat Bibi’s ‘Stay With Me’, which could be a summer hit. Shane has been instrumental in creating McQueen’s profile and his mix of deep house medleys, accompanied by tasteful soulful undertones, is exactly the kind of vibe you can expect from the DJs in the bar as the party starts to warm up. On disc two, Timo Garcia takes the tempo upscale and the vibe deeper with strong tech injections, including Dave Davis & Kolombo ‘Girlz in Wonderland (Donatello Mix)’ and DJ Pierre & Timo Garcia’s ‘Phuture Flashback’ mixed by Purple Disco Machine. Garcia has had productions and remixes on labels including Skint, Yoshitoshi,Stealth, Toolroom, Compost and CR2, and his selection on ‘McQueen Shoreditch’, including five exclusive tracks by Mikael Delta and Emeskay, harmoniously complement disc one.